Kingbird raised garden bed has more advantages in convenient assembly, advanced and pressure-resistant design, and color selections. Jade-green and charcoal-grey, these natural color can make a beauty blending into any landscape, your garden, backyard, patio, rooftop, landscape. 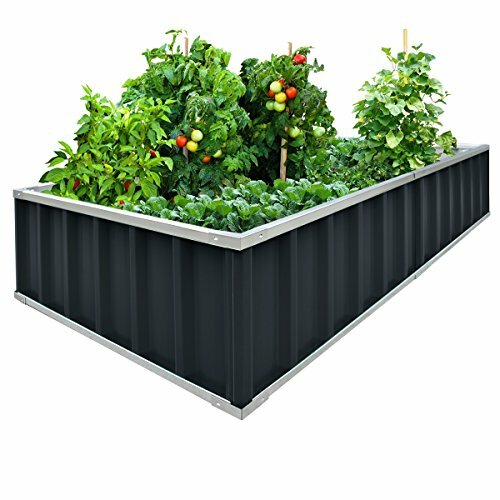 7.Unlike the wood material, galvanized steel garden bed will not rot assuring years of reliable use. Size: 68" x 35.5" x 12"
【Vertical Stripe Updated Design】We combine the vertical stripe and the card holder design to improve the garden bed ability in bearing the soil and make the garden bed more textured and beautiful. This can prolong the service time of the garden bed. If you have any questions about this product by Kingbird, contact us by completing and submitting the form below. If you are looking for a specif part number, please include it with your message.